The African honey bee (Apis mellifera scutellata) is a subspecies of the Western honey bee. It is native to central and southern Africa, though at the southern extreme it is replaced by the Cape honey bee (Apis mellifera capensis). This subspecies has been determined to constitute one part of the ancestry of the Africanized bees (also known as "killer bees") spreading through America. The introduction of the Cape honey bee into northern South Africa poses a threat to African honey bees. If a female worker from a Cape honey bee colony enters an African bee nest, she is not attacked, partly due to her resemblance to the African bee queen. As she is capable of parthenogenetic reproduction, she may begin laying eggs which hatch as "clones" of herself, which will also lay eggs, causing the parasitic A. m. capensis workers to increase in number. The death of the host colony results from the dwindling numbers of A. m. scutellata workers that perform foraging duties (A. m. capensis workers are greatly under-represented in the foraging force), the death of the queen, and, before queen death, competition for egg laying between A. m. capensis workers and the queen. When the colony dies, the capensis females will seek out a new host colony. 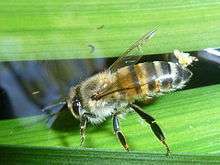 A single African bee sting is no more venomous than a single European bee sting, though African honeybees respond more quickly when disturbed than do European honey bees. They send out three to four times as many workers in response to a threat. They will also pursue an intruder for a greater distance from the hive. Although people have died as a result of 100-300 stings, it has been estimated that the average lethal dose for an adult is 500-1100 bee stings. In terms of industrial honey production, the African bee produces far less honey than its European counterpart, whilst producing more swarms and absconding (abandoning its nest). For this reason, African races of Honeybees are less desirable than European races, except where the proclivity of African bees give beekeepers no other option due to the Africans' tendency to invade and take over European nests. The appearance of the African honeybee is very similar to the European bee. However, the African honeybee is slightly smaller. The average body length of a worker is 19 mm. Its upper body is covered in fuzz, and its abdomen is striped with black. The native habitat of Apis mellifera scutellata includes the southern and eastern regions of Africa. The species was first imported across the Atlantic Ocean to Brazil before it spread to Central America, South America, and southern areas of the United States. The Africanized honey bee thrives in tropical areas and is not well adapted for cold areas that receive heavy rainfall. Honeybees are challenged to balance energy consumption and replenishment in their pursuit of nectar. High thoracic temperatures required for foraging flight pose a thermoregulatory imbalance that honeybees attempt to alleviate by targeting particular viscosities and temperatures of nectar resources. In lower environmental temperatures where energy loss is more pronounced, it has been shown through Apis mellifera scutellata that honeybees seek warmer, less-concentrated and less-viscous nectar, an energetically favorable behavior. Nectar that is highly concentrated in sugar is more viscous and therefore reduces the speed of consumption and the size of honeybee crop loads. In cooler ambient temperatures, harvesting small, concentrated quantities of nectar does not allow honeybees to maintain the metabolism necessary for foraging flight. Harvesting warmer, less-viscous nectar is advantageous because of the energy gained by heat. Honeybees are able to stabilize their body temperature and make up for the energy lost by flying. In A. mellifera scutellata, it was found that crop loads were largely contained in the abdomen, though it remains unclear whether this balances out the aforementioned energy loss from the thorax during flight. It appears that the cost of harvesting less-viscous nectar is that it is also less concentrated in sugar and would be an energetic loss for the honeybees. However, this is not the case; the speed of harvesting nectar with less viscosity increases the quantity harvested at a given time. The relative advantage is so great that it is still more energetically favorable for a honeybee to collect warm nectar even at low sugar concentrations (10%.) Honeybees are energetically rewarded by harvesting nectar that is warmer than ambient temperatures because they make up for energy loss during foraging and obtain more nectar more easily. The bumblebee’s ability to differentiate flower warmth by color and target warmer flowers is one noted precedent for nectar temperature selection in honeybees. It has been noted that A. mellifera scutellata have higher rates of colony growth, reproduction, and swarming than European honey bees (A. mellifera ligustica and A. mellifera mellifera), a fitness advantage that allowed them to become an invasive species. A study by Fewell and Bertram was conducted to understand the source of these differences. The differences in fitness strategy were thought to be accounted for by the fact that African worker bees have a greater preference for pollen over nectar, which is a direct food resource for the emerging brood. Another important factor was thought to be differences between the species in age polyethism, or the allotment of different tasks as a honey bee ages. Young worker bees focus on in-hive assistance such as brood care, and the relatively younger African bee populations were thought to be one explanation for the emphasis on reproduction and colony expansion in the species. The study was also interested in the role different colony social environments and different genetic variation might play in the fitness discrepancies between the two sub-species. The main difference found between African and European honey bees were a few behavioral traits in the worker bees that were all related to the workers’ food preference. It was found that Apis mellifera scutellata workers focused on pollen processing behaviors while European workers focused on nectar processing behaviors. African bees were also more likely to store pollen while European bees stored honey. The study found that worker food preferences determined whether the colony maintained a certain reproductive rate. For example, having fewer or relatively older workers who prefer nectar means that the colony will not have the resources available to rapidly or efficiently feed new broods. Worker food preferences have been connected to genotypic variation at specific quantitative trait loci. African bees are “precocious foragers;” A. mellifera scutellata bees begin foraging for pollen significantly earlier than their European counterparts A. mellifera ligustica, and this is thought to be related to the fact that African colonies have a younger, skewed age distribution by comparison. However, this is not a direct cause for the different subsistence strategies between the two subspecies. Over time, distributions of the genotypic traits for worker food preference must have clustered around those conferring a proclivity towards resources that improved the fitness of the subspecies. The balancing of evolutionary costs and benefits have shaped the distribution of these genotypic traits. A bee population must strike a balance in the distribution of resources towards the growth of the current colony members versus reproduction. If too much energy is expended on the maintenance of an adult colony, the bees will lose the chance to expand through reproduction but they will have older workers who specialize in nectar resources for energy (honey.) If too much energy is spent on reproduction, such a colony will be less equipped to survive drastic seasonal changes because they have younger workers who specialize in pollen for feeding the brood, not energy storage. These two strategies have been adopted by the European and African bees respectively. European bees must survive the winter, an annual event with predictable mortality outcomes. Trying to meet the energetic needs of the colony and reproduction might decrease their overall survival during the winter and it is more evolutionarily favorable for them to store nectar and honey. African bees are more vulnerable to less predictable times of scarcity or attack and it is therefore to their advantage to produce as many young as possible, increasing the likelihood that some or even many will survive. Such circumstances would have favored the worker bees who preferred harvesting nectar in European colonies and pollen in African colonies, providing an explanation for how a divergence in worker behavior and age distribution evolved in Apis mellifera scutellata and Apis mellifera ligustica. Fewell and Bertram’s study is significant in that it provides a plausible method through which the fitness characteristics of the subspecies could have evolved from a small number of behavioral differences in worker bees. 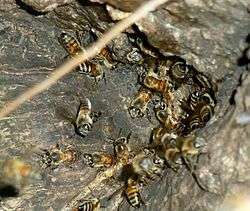 A strain of Apis mellifera capensis has monopolized social parasitism of Apis mellifera scutellata hosts in South Africa. Specifically, a strain of A. mellifera c. workers produce crucial pheromones, achieve reproductive status, and overthrow an A. mellifera scutellata queen. Social parasitism in the social insects can involve various forms of exploitation that disrupt the normal division of labor in the colony. The recent development of technology to study the genetic makeup of colonies has revealed that the offspring contribution of reproducing worker parasites merits closer attention. In 1990, 400 A. mellifera c. colonies were moved into the vicinity of A. mellifera s. species. Ten years later, a single clonal…worker lineage was found to be devastating A. mellifera scutellata colonies in northern South Africa. The monopoly of this single lineage shows that they were able to subvert queen regulation of reproduction and worker recognition mechanisms. Dietemann et al. was able to prove that A. mellifera c. worker parasites were able to produce mandibular pheromones that mimic that of A. mellifera s. queens while in their presence. The resulting breakdown of the division of labor leads to desertion or death of the parasitized colony. Although many pheromones contribute to reproduction, pheromones made in the mandibular gland of queens have been closely linked to reproduction, and they are produced by workers that reproduce. The pheromones prevent others from attacking them, induce workers to recognize them as queen, and give them access to higher quality foods. They also stop other workers from turning reproductive. A. mellifera c. worker parasites create female clones and usurp the A. mellifera s. queen. The worker parasites and their increasing number of clones become the sole reproductive individuals in the colony. The destruction of the division of labor leads to reduced resources that eventually force the colony to leave or perish. The single lineage of parasitizing A. mellifera capensis may have gained evolutionary advantage because, compared to other related species, it is not susceptible to the host queen’s pheromonal reproductive suppression of workers. The non-invasive varieties of A. mellifera c. produce less mandibular secretions than the invasive strain. In addition, they produce secretions that are not as similar to that of A. mellifera s. queens as that of the invasive strain. The single lineage was selected for its greater resistance to and greater ability to mimic and overwhelm the pheromonal regulation by host queens. It was discovered that A. mellifera s. queens produce more pheromones than A. mellifera c. queens, suggesting that quality or content of pheromones rather than quantity may explain how A. mellifera c. workers are able to disregard host queen signals. Pheromonal differences between the subspecies is a subject that requires more in-depth investigation to understand how such parasitization is made possible. As mandibular pheromones were a focus of the Dietemann et al. study it is probable that different glands contribute to the pheromones related to reproductive status. The multifaceted aspect of communication in social insects makes social insect colonies easy to hijack. Especially in the case of closely related species and subspecies, the biology and organization of potential host species are similar to that of potential parasitizing species, making them easier to infiltrate. On the other hand, potential parasites face the challenge of being discovered by the host queen, usually the sole reproductive individual in the colony. The existence of A. mellifera capensis worker parasites is an example of an alternative evolutionary strategy that allows them to increase their “direct fitness in foreign colonies rather than inclusive fitness in their natal nests." Workers usually focus their efforts on raising and caring for larvae that are related to them, thus preserving the propagation of their genes and contributing to their inclusive fitness. The parasitic model is more advantageous by comparison because it allows workers to directly reproduce offspring that are more closely related to them and greater in number, so they are a component of direct fitness. The invasive lineage of A. mellifera c. succeeded either because of an inability to recognize the host A. mellifera s. queen signal correctly or a resistance to the signal. Ultimately this is an interesting example of a preexisting weakness towards social parasitism by A. mellifera capensis in A. mellifera scutellata. Organisms evolve reproductive strategies that ensure the survival and propagation of the organisms’ genes. Successful reproductive strategies cope with particular economic constraints experienced by the organism. The parasitic relationship between A. mellifera scutellata and A. mellifera capensis is an example of how a normally successful strategy of chemical recognition and maintenance of a reproductive division of labor can be undermined by competing, exploitative strategies. The underlying hypothesis for the aggressive behavior of African bees is based on the idea that this race of bees evolved in an arid environment, where the bee's food was scarce. Under this situation, selection favored more aggressive colonies, which protected their food source and hive from predators and robber bees from other colonies. This behavior allowed more aggressive colonies to survive where the less aggressive colonies eventually were selected against by natural selection. ↑ Materson, J. "Apis mellifera scutellata". Smithsonian Marine Station. Retrieved 1 November 2013. ↑ Masterson, J. "Apis mellifera scutellata". Smithsonian Marine Station at Fort Pierce. Retrieved 2013-12-08. 1 2 3 4 5 Nicolson, Susan; Leo de Veer; Angela Kohler; Christian W. W. Pirk (2013). "Honeybees prefer warmer nectar and less viscous nectar, regardless of sugar concentration". Proc. R. Soc. B. 280: 1–8. doi:10.1098/rspb.2013.1597. ↑ Shafir S., Afik O (2007). "Effect of ambient temperature on crop loading in the honey bee, Apis mellifera (Hymenoptera: Apidae)". Entomol. Gen. 29: 135–148. doi:10.1127/entom.gen/29/2007/135. ↑ Heyneman, AJ (1983). "Optimal sugar concentrations of floral nectars: dependence on sugar intake efficiency and foraging costs". Oecologia. 60: 198–213. doi:10.1007/bf00379522. ↑ AG, Dyer; Whitney HM; Arnold SEJ; Glover BJ; Chittka L (2006). "Bees associate warmth with floral colour". Nature. 442: 525. doi:10.1038/442525a. ↑ Winston, ML; OR Taylor; GW Otis (1983). "Some differences between temperate European and tropical African and South American honeybees". Bee World. 64: 12–21. 1 2 3 4 5 6 7 8 9 10 Fewell, Jennifer H.; Susan M. Bertram (2002). "Evidence for genetic variation in worker task performance by African and European honeybees". Behavioral Ecology and Sociobiology. 52: 318–325. doi:10.1007/s00265-002-0501-3. ↑ Page, RE; Robinson GE (1991). "The genetics of division of labour in honey bee colonies". Adv Insect Physiol. 23: 118–169. doi:10.1016/s0065-2806(08)60093-4. ↑ Hunt, G; Page R; Fondrk M; Dullum C (1995). "Major quantitative trait loci affecting honey bee foraging behavior". Genetics. 141: 1537–1545. ↑ Giray, T; Guzman-Novoa E; Aron CW; Zelinsky B; Fahrbach SE; Robinson GE (2000). "Genetic variation in worker temporal polyethism and colony defensiveness in the honey bee, Apis mellifera". Behav Ecol. 11: 44–55. doi:10.1093/beheco/11.1.44. ↑ Seeley, TD (1978). "Life history strategy of the honey bee, Apis mellifera". Oecologia. 32: 109–118. doi:10.1007/bf00344695. ↑ McNally, L; Schneider S (1996). "Spatial distribution and nesting biology of colonies of the African honey bee". Environmental Entomology. 25: 643–652. doi:10.1093/ee/25.3.643. ↑ Schmid-Hempel, P (1998). "Parasites in social insects.". Princeton University Press. ↑ Hartel, S; Neumann P; Raassen FS; Moritz RFA; Hepburn HR (2006). "Social parasitism by Cape honeybee workers in colonies of their own subspecies (Apis mellifera capensis Esch.)". Insectes Sociaux. 53: 183–193. doi:10.1007/s00040-005-0857-2. 1 2 3 4 5 Dietemann, Vincent; Jochen Pflugfelder; Stephan Hartel; Peter Neumann; Robin M. Crewe (6 October 2006). "Social parasitism by honeybee workers (Apis mellifera capensis Esch. ): Evidence for pheromonal resistance to host queen's signals". Behavioral Ecology and Sociobiology. 60: 785–793. doi:10.1007/s00265-006-0222-0. JSTOR 25063876. ↑ Hartel, S; Neumann P; Kryger P; von der Heide C; Moltzer G-J; Crewe RM; van Praagh JP; Moritz RFA (2006). "Infestation levels of Apis mellifera scutellata swarms by socially parasitic Cape honeybee workers (Apis mellifera capensis Esch.)". Apidologie. 37: 462–470. doi:10.1051/apido:2006012. ↑ Hoover, SER; Higo HA; Winston ML (2006). "Worker honeybee ovary development seasonal variation and the influence of larval and adult nutrition". J Comp Physiol B. 176: 55–63. doi:10.1007/s00360-005-0032-0. ↑ Schafer, MO; Dietemann V; Pirk CWW; Neumann P; Crewe RM; Hepburn HR; Tautz J; Crailsheim K (2006). "Pollen consumption and worker reproduction in Cape honeybees (Apis mellifera capensis Esch.)". J Comp Physiol. ↑ Neumann, P; Moritz RFA (2002). "The Cape honeybee phenomenon: they sympatric evolution of a social parasite in real-time". Behav Ecol Sociobiol. 52: 271–281. doi:10.1007/s00265-002-0518-7. ↑ Holldobler, B; Wilson EO (1990). "The ants". Springer. ↑ Davies, Nicholas B. (2012). An Introduction to Behavioral Ecology. West Sussex, UK: Blackwell Publishing. pp. 307–33. ISBN 978-1-4051-1416-5. ↑ Dawkins, Richard (2006). The Selfish Gene. New York: Oxford University Press. pp. 66–88. ISBN 978-0-19-929115-1. Wikimedia Commons has media related to Apis mellifera scutellata. Species Profile: Africanized Honeybee (Apis mellifera scutellata) — National Invasive Species Information Center, United States National Agricultural Library. Lists general information and resources for Africanized Honeybee.